for letting me observe their science lesson. Watch the video below to see one way of making a simple helicopter. Imagine you have been asked to design a helicopter to drop supplies to people in a remote disaster area. A controlled descent and soft landing is essential - too fast might damage the load and too slow might blow off course! Here is a template for one possible helicopter (Word, pdf). Once you have had a go, think about how the helicopter could be adapted. How would you decide on the best possible helicopter design? You will need to decide the height from which you will drop the helicopter, and the load it will carry. 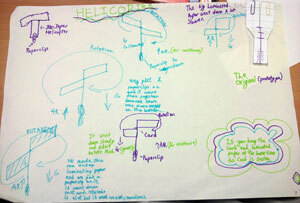 Thanks to Jim Flood, former staff tutor in Technology at the Open University, for the design of the helicopter template. Handling data. Technology. Video. Processing and representing data. STEM - General. STEM - physical world. Interpreting data. Logo. STEM clubs. STEM - design technology.